In this, our first episode, we’re going to talk about submitting your shows to the most important podcast directories. A basic marketing activity when you’re first launching a show, but it’s also one of the most important ones, and that’s why I thought we’d start here. 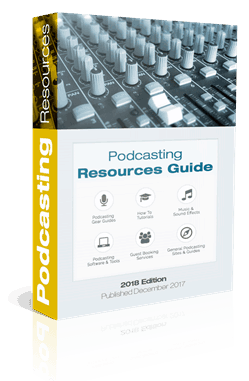 If you are a new podcaster, you may wish to review our comprehensive podcast marketing guide, and you will find the links to all the directory entries where you need to submit your show at the bottom of this post, so it makes it much easier. And I’m hoping that the directories we will cover here will be the first and most important marketing step for you to take. If you’re a veteran podcaster, I’m just thinking this is a double check, or a checklist, because several new directories have come along in the last year you might not have submitted your show to if you launched your podcast more than a year ago. So, ensuring that your podcast is easily discovered on all existing platforms is a passive promotion method, but still, it’s sort of part of the launch phase, and it’s also one of the easiest approaches you can take, because it just requires you to fill out several forms on some podcasting sites and directories out there. And what’s different about the guide I’m trying to put together here is that it also includes traffic statistics from SimilarWeb, so I have gone in and I’ve looked up the traffic stats for the most important podcast directories. I’m hoping this will give us inspirations, because you’re seeing that there are millions, or sometimes, hundreds of millions, of listens, or visitors, on those directory sites. Because of this you want to have your podcast discoverable there. You want people to find it based on what they are searching for, keyword searches they might do in those directories, or on those apps they download. And, some directories I’ve come across, and that I see listed in more prevalent blog posts out there of directories to submit to, some of those get little traffic at all. And so, I think it is not even worth the effort. So, 50,000 is a cutoff point I’ve arbitrarily decided on. The biggest podcast directory is iTunes, and I’m just listing it here for completeness, but I’m also think it’s the most important directory for a reason that some beginner podcasters don’t even think of. It is the directory that most mobile apps use to list your podcast from. For most of the mobile apps and podcatchers out there, your podcast is actually listed on those apps because they pull their directory feed from iTunes. This way, you can safely publish your podcast episodes when you’re first doing a launch, and unless you’ve listed it on iTunes and some other directories, that means that, no one will download it. So it’s a good way to test to make sure that your feeds are working correctly, that your website is working, that your show notes are showing up, and that someone can actually listen to your podcast and subscribe via email on your website. And you can let weeks go by before then executing your podcast launch strategy and by submitting it to iTunes. Now, iTunes submissions are handled by a Podcast Connect, Apple’s Podcast Connect platform, and it’s just a matter of logging in, and providing your credentials, and some information about your show. So, the actual doing it is simple. And obviously, their website is super popular, 224.7 million visits a month. Although I have to say some of that is for apps, for videos, and for other activity, so in a way that’s not an accurate reflection of a podcast statistic, that’s just iTunes getting a lot of traffic. The next one we want to talk about and cover is Spotify. Spotify is a relatively new player on the scene, but it’s been growing quick. I mean, as you can see from the web statistics, it’s almost as big as iTunes, and they’ve only, in the last year, allowed podcasts into their ecosystem. And also, the statistic for Spotify are a little skewed because there’s music and a lot of other traffic generated that has nothing to do with podcasts. But still, obvious that if Spotify has a podcast directory, you would want to be on it. The submission process to Spotify has been, up to this point, somewhat obscure, in so far as that you had to be with one of their preferred podcast providers. So if you were hosting a show on Libsyn, for example, Spotify considered them a preferred content partner. This made submission easy. But for people not on the most popular platforms there was no way to get their podcast into Spotify. Let’s have a look at what that looks like on Libsyn, for example. This screenshot, for example, is a show we’ve launched in the past on Libsyn, and how they handle it is that they set Spotify up as a destination. This process of submitting a podcast on Spotify takes up to two weeks right now. Now, recently they’ve launched their own podcast portal, and that means now you can submit your show even if it’s not hosted on one of the big players, so that’s good if you are hosting your show on WordPress or elsewhere. But there is a drawback, your podcast analytics might not reflect correctly if you are submitting it from your own feed, because what Spotify does is that is caches your episodes, and sort of temporarily hosts them, on Spotify. And so, that means that it can mess with your podcast analytics stats. And if you are with one of the larger providers, they’ve worked that out with the API connection between them and Spotify. So, if you’re on Libsyn, you will get accurate statistics, and that’s why I recommend that don’t use the Spotify partner portal unless you have to, unless you are with one of the smaller or non-present podcast providers right now. Likewise, if you’re with one of the bigger players, by all means, submit your show through their process, like the one I showed from Libsyn. Okay, moving on, Stitcher is very popular. In fact, it was one of the more popular podcatchers and podcasting apps next to iTunes. And as we can see in the video, Stitcher gets about 4.18 million visits a month. Keep in mind that Stitcher is a pure podcasting platform so that shows you how big they are. And so, they don’t have other music, this is all podcasting traffic, so you definitely want to have your show present. You submit via the podcast partner sign-up page, and all these links are in our Podcasting Directories section for this episode (see below). An even better way is to subscribe to access our Podcasting Resources Guide, which is a live document where we keep these directories updated and add new ones all the time. You can download this below. The podcast partner sign-up page for Stitcher Radio just walks you through the process of creating an account there and configuring your show. You get to put in some custom graphics, and you get to pimp out your podcast homepage to look good, and I would definitely recommend going through that trouble. And once you’re on the partner portal, you can configure your show, you can make changes, and you can get statistics about it. So, Stitcher is a popular destination even though it’s become so competitive, and there are so many pod catchers out there, it’s not as popular a platform as it was, perhaps, like in 2014, ’15, ’16. However, with four million visits a month, you want to be on Stitcher. Submitting to Google Play is a no-. Google has been spending a lot of time, and a lot of effort, in developing their own podcast app and environment, so they’re very bullish on podcasting. It’s rolling out slower than maybe some of us expected, but still, it is a super popular platform and anyone with an Android device is likely to get a pod catcher through Google Play and find your show on Google Play somehow. So, Google is a fantastic destination. It also allows you to a lot of customization in how your podcast homepage looks there, and you have to go through their approval process. TuneIn Radio has been around for a long time. I do think that it has some music traffic as well, but it does list podcasts, and has listed podcasts for a long time, so it’s a very popular destination. Their website gets about 24 million visits a month, no reason not to submit there. Same is true for iHeart Radio, another podcast directory that gets your podcast information from your hosting platform. So, just like was the case with Spotify, the iHeart Radio submission process, if you’re on Libsyn, is handled through the Libsyn backend. And I’m pretty sure on Blubrry you have a direct way to submit your show as well. I’m listing that here in our How to Promote Your Podcast Guide, and the web statistics are about 30 million visits a month, so must have. Now, when I first started I thought, well, I’m hosting my podcast on Libsyn, and so it never occurred to me to submit my show to Blubrry to be listed in their directory. I wasn’t even aware that that was possible until much later. And so, you might not have thought of that either if you’re on Libsyn, or if you’re hosting your podcast elsewhere. They get over a million visits a month, and they allow you to submit your show even if you’re not hosted on Blubrry. I made the mistake of thinking of Blubrry as strictly a podcast hosting platform, but it has a very popular directory as well, and so it’s a good idea to submit your show there. And the same is true for the next one, , gets about four million … five million, 4.89 million visits a month, so very popular podcasting platform, but also a podcasting directory. And create an account there, but then instead of submitting your own, or creating your own, and setting up your own podcast there, you simply submit your own show to be included in their directory, so that’s well worth it. Spreaker, another one like that, almost the same amount of statistics, four million visits a month. They have a sign-up page, it’s simple, you supply your RSS feed there, and get your podcast listed on their directory, and discoverable on their directory. Player FM is a multi-platform podcast app, it helps you find topics that you care about, and it also has an offline component. So, 7.29 million visits a month, so that’s a very popular audio listening platform, so do submit your podcast there as well. Acast is a hosting service, again, but also has their own directory. So here’s another one like, you know, like Spreaker, and like Blubrry was. So submit to , gets about 2.21 million visits a month. You know, the sign-up process is a little confusing. Let me show you a screenshot. So, what happens with them is they consider this a non-hosted show, and that just means that you can go here and click on the get started tab to include your own podcast feed, and then your podcast will be included in their pretty great directory. Digital Podcast, about 81,000 visits, so now we’re getting into some smaller players. You know, still a directory that I would submit to. RadioPublic, about 378,000 visits a month. This site features a handpicked list on their front page. And if shows are handpicked, and if they appear on the front page, your chances of being discovered and included in a smaller directory like this are actually greater. So that’s one of the reasons that it’s worth attempting to submit to some of these directories where you may actually be listed, or featured, on their front page. You will at least have a better chance than you would on iTunes, or Google Play, or one of the huge directories. 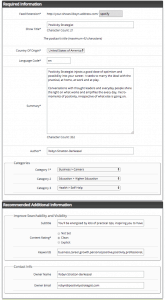 ListenNotes claim to have audio transcripts of about a half a million podcasts, and their site actually translates, or transcribes the podcast audio, and that makes it searchable. So, that’s an interesting approach, and for that reason alone I would suggest checking to ensure your podcast is there. In most other directories the keyword searches are limited to your podcast title, and, in some cases, your descriptions, in iTunes it’s the author tag, but the actual content of the show is really not searchable. And so, ListenNotes is a little unique in so far as that it tries to automate that. Now, if I do a web search for my term, I would rather be found on my own website than on ListenNotes, and that’s something you would want to watch out for. Anyway, they get about 236,000 visits a month, and so that is a place you want to submit to. And now we’re getting into some ones that are less popular, sometimes, Good Pods, these are directories that I’m seeing listed in other peoples’ blog posts as directories you should submit to, but when I look on SimilarWeb they don’t even show up, or they don’t even have a mobile responsive site. So, my attitude is that I won’t bother unless it’s above 50,000 or so visits per month. So I’m hoping that this is making sense to you. I’m hoping that you found this walk-through or little checklist useful. You go through the list below one at a time. Check to see whether your podcast is present on any of these networks, and if it’s not, and it has hundreds of thousands, or even millions, of visitors, well, just submit your show. Next time what we will talk about is promoting your podcast by being a guest on other peoples’ shows. We’ve got some “podcast guesting” scripts to share with you and are excited to get that going in our next episode. Ensuring your podcast can be easily discovered by listeners on existing platforms may be a passive promotion method. This is also one of the easiest marketing approaches you can take. You're looking to make sure your podcast has the most reach possible. Being in the right podcast directories is a great start towards marketing your podcast. Why I'm including web stats for each directory: For each directory I'm including sign-up links as well as web stats from Similarweb as a relative measure of popularity for each platform. I'm adding this research as a form of encouragement. You can decide for yourself if the traffic to these directories is worth your submission effort. My own approach: if the platform has more than 50K visits a month, it's worth submitting. Many have 100s of million visits a month. A podcast hosting service with it's own app and directory. You can submit your show to be featured on their site and inside their app. Select the "Non Hosted Show" option and submit your feed URL. Web Stats: 2.21M visits a month. iTunes is pretty obvious, and I'm just listing it here for completeness. It is the most important directory. But perhaps not for the reason you think. Most people focus on submitting to iTunes in order to be in the "New and Noteworthy" section. Good Pods is a little different in that it is a podcast curation platform. This means you need to apply and provide a brief justification why they should promote your podcast and why it should be included in their directory. Web Stats: Not available, may indicate the platform is no longer active. Google play is putting a lot of effort into developing their podcast app and overall podcasting ecosystem. This is good news, and if your show is not on Google Play yet, I would definitely add it there. Google Play has a podcast portal where you can submit your show. Web Stats: 1.4B visits a month, keep in mind that this includes everything on Google Play. Podcast search engine that claims to have audio transcripts of 542,280 podcasts. Their web stats seem to indicate a good level of activity, so I am listing it here. Web Stats: 236K visits a month. Player FM is the multi-platform podcast app that helps you find shows on the topics you care about and play them at your convenience, even when you're offline. Web Stats: 7.29M visits a month. Mainly a podcast hosting company, but also has an extensive podcast directory. Create an account on Podbean, then submit your podcast feed URL. Web Stats: 4.89M visits a month. Handpicked podcast playlists from people who love podcasts. Web Stats: 378K visits a month. Spotify is a relatively new player, but has been growing fast. Most podcast hosting services now provide integration with Spotify. 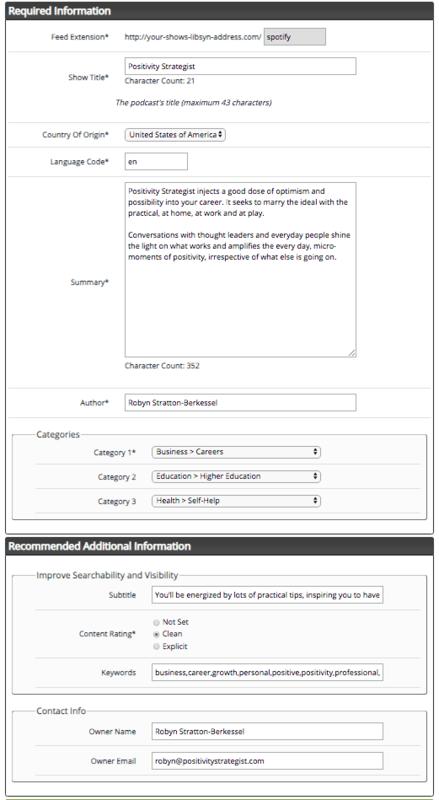 In Libsyn, for example, you can define Spotify as a target publishing destination. Libsyn also provides detailed "how to" guides on setting this up in the first place. Submissions to Spotify are handled inside your podcast hosting platform. This should be the preferred way to publish on Spotify, as I understand it "preferred partner hosts" like Libsyn integrate with Spotify so that you get analytics. Like Blubrry, Spreaker is both a hosting platform as well as a podcast directory. You can submit your show even if it is not hosted there. You sign up for an account, and then supply your RSS feed there. Web Stats: 3.95M visits a month.